Two make gooseberry wine Gather your gooseberries in dry weather when they are half ripe pick them and bruise a peck in a tub with a wood mallet then take a horse-hair cloth and press them as much as possibel without breaking the seeds. 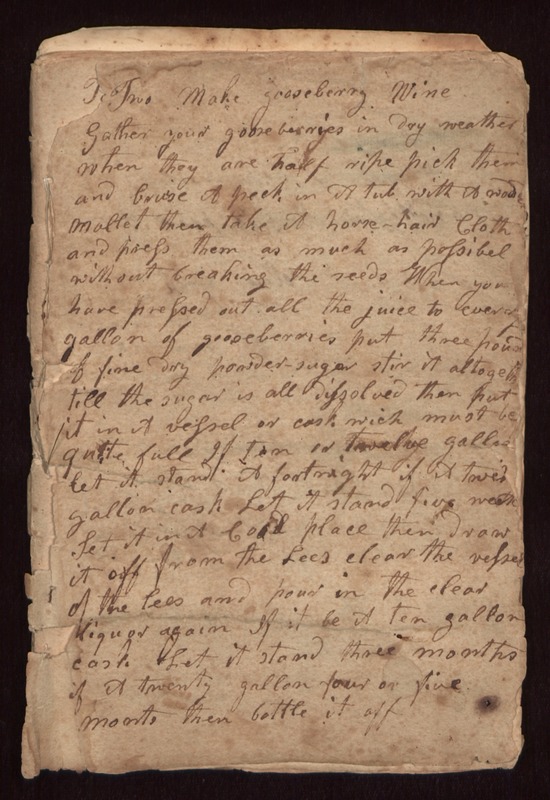 When you have pressed out all the juice to every gallon of gooseberries put three pound of fine dry powder-sugar stir it altogether till the sugar is all dissolved then put it in a vessel or cask wich must be quite full If ten or twelve gallon let it stand a fortnight if a twen[ty?] gallon cask Let it stand five weeks Set it in a cold place then draw it off from the lees clear the vessel of the lees and pour in the clear liquor again if it be a ten gallon cask. Let it stand three months if a twenty gallon four or five months then bottle it off.